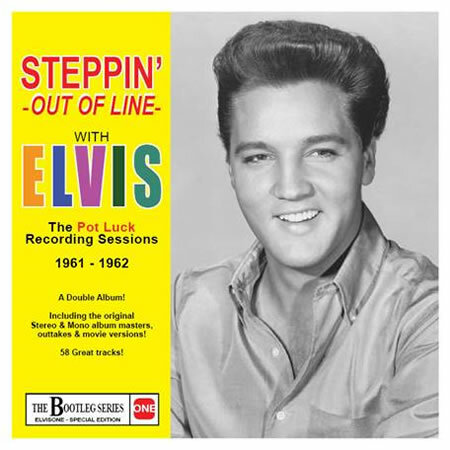 Due for release this month is 'Steppin' Out Of Line : The Pot Luck Recording Sessions 1961-1962' a special edition 2 CD set limited to 500 copies only from 'The Bootleg Series' with 58 great tracks, including the original Stereo and Mono album masters, outtakes (not released by Elvis' record company*) and Movie Versions from the 'Pot Luck' album all on one double CD. Includes a booklet with recording information. (*with the exception of the outtakes released on the 'Elvis For Everyone' FTD). Limited edition of only 500 copies. Another quick buck release brought to you by the ONE label. *with the exception of the outtakes released on the 'Elvis For Everyone' FTD. I have a good collection of out-takes from this era on various older releases (FTD, Memory, and imports), so I may well have most of what's on this album, BUT...as with other entries in this series, it's very thoughtfully and attractively put together, it does not cost THAT much (certainly less than the usual 2-cd "import"), and it's nice to have all this material in one place: the complete mono and stereo albums, the movie versions, alternate takes, and versions without backing vocals. I've been playing it a lot since it came out, and I think it's well worth it for anyone who is a fan of the classic POT LUCK album. For me, this is a lot LESS of a "quick buck" release than those "import" packages where already released material (sometimes released by FTD!) is paired with a "book" of pictures lifted from various sources. I just don't get it am I missing something here as to why this is described as a quick buck release ? The Pot Luck album is a pretty decent album right ? For an outtake collector like myself who does not have these recordings its a chance to get them right ? It's a 2 disk set right ? . Do we know if the sound quality is bad or another reason not to purchase, has it just been thrown together without any care ? I would appreciate any feedback please as I am looking at buying this one to sit alongside my FTD version . Thanks in advance.